The entire purpose and function of a Will is to direct your estate in Probate Court. All the property you own personally is suddenly owned by no one the moment you pass away. The Will itself cannot transfer ownership of any assets to your heirs. Only the authority of the State can transfer your property to new owners. Assuming your Will is legally reliable, the Probate Court will authorize your Executor to make those transfers according to the wishes in your Will. Probate, however, first requires several procedural tasks notifying all your beneficiaries of the inventory of your estate, and also notifying your creditors of their opportunity to bring claims against your estate. Beneficiaries, and potential beneficiaries, may also bring disputes about the interpretation of your Will, its validity, its veracity, or even its fairness. For these and other reasons, estates in Probate are public information. The specific language of a Will is crucial. A good Will makes your intentions clear and unambiguous, demonstrating that you are aware of what you own, and of who your children or other natural heirs would be. It clarifies the deliberate wishes of a sound mind, and prevents confusion and conflict between heirs. A Will must be signed by you the Testator, and witnessed by two other adults who are not named by your Will as beneficiaries. It should be notarized. A Will is then merely a set of instructions the Probate Court may safely rely on when dividing your estate after your death. A Trust is a legal entity that can live perpetually. It owns your property for you, so that when you pass away there is no break in ownership, and no need to involve the Courts. While you are alive, you are the Trustee of your Living Trust, and you direct the spending, lending, use, trade, sale, encumbering, etc. of your assets just as though you owned them personally. A successor Trustee of your choosing assumes management of the Trust assets when you pass away, or before, if you elect. The successor Trustee may be a friend or relative, or it may be an attorney, a corporate Trustee, or a fiduciary. 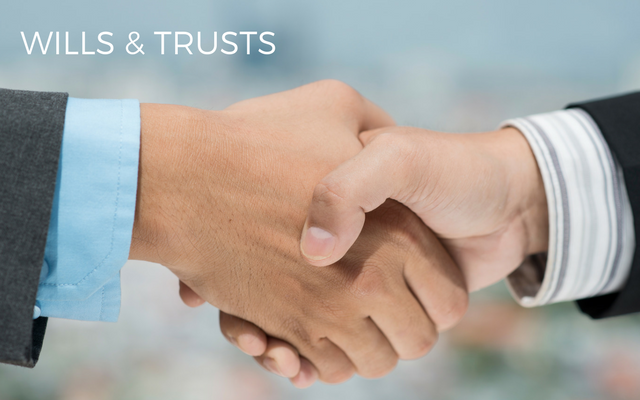 The Trustee administrates the uses or disbursements of the assets according to your instructions in the Trust. A Trust is capable of more than a Will. The preparation and funding of a Trust eliminates the need for Probate at your death, and similarly, eliminates the need for Conservatorship if you are incapacitated. While a Will can only leave an heir his or her entire portion, a Trust can also direct the use and management of that portion for the benefit of the heir through the future. A Trust can hold a beneficiary’s portion until specific conditions are met, or even to protect it from the beneficiary’s creditors. Your Trust can continue to invest or pursue other goals and objectives long after you are passed away. When one spouse dies, a Trust can divide the Estate in to two, one for the deceased, and one for the surviving spouse. This allows both spouses to claim the full Estate Tax exemption. The administration of your Trust after your passing can remain private, different from the public exposure of Probate. A Beneficiary Deed will transfer a home or other property directly to a new owner upon your death without having to go through Probate. A Beneficiary Certificate, or, Payable on Death Certificate will transfer an insurance policy, an annuity, CDs, liquid accounts, etc. to a new owner upon your death without having to go through Probate. Most financial establishments will divide the assets between several beneficiaries. Appointment of an agent as a Durable Financial Power of Attorney will avoid the need for Conservatorship, or Guardianship in the event of your incapacity. Too commonly, people name an adult child or other confidant as a co-signer on their accounts as a plan for possible incapacity. This is not advisable and can open the door to great harms with no recourse. It is much wiser to name that trusted individual as your agent in a Durable Financial Power of Attorney document. This enlists other levels of protection for both you and your agent. Your Power of Attorney can only be in force while you are alive, and is no longer valid or binding after your death. As is the case at Millett Law Office, an Estate Plan typically includes a Trust Agreement, a Certificate of Trust, a Pour-over Will, Medical Power of Attorney, Living Will, Durable Financial Power of Attorney, and a Deed if necessary.